Once the base fully envelops you, Gianni Versace becomes like a full-bodied wine, with dark fruits and spices punctuated with a long stretch of dirty, sweaty animalic leather. There's a real progression of notes, moods and affects in this perfume, and they're cumulative, leading to a sublime crescendo comparable to dramatic moments in Beethoven and Brahms concertos. The "too-muchness" of Gianni Versace doesn't so much herald the 1980s big-shouldered perfumes as it harkens back to what made old-school, vintage perfumes so good: their distinctive personalities, the courage of their perfume convictions, their lingering atmospheres. It's an 80s version of an olfactory Orientalist fantasy from perfumery's bygone days, comparable to a Narcisse Noir (1911), a Le Numéro Cinq (1925), or a Youth Dew (1952). 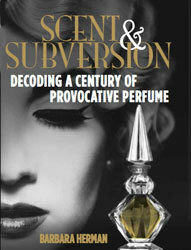 It's easy to demonize perfume now in the service of a kind of olfactory puritanism — or straight up misogyny. (After all, if perfume reads as "feminine," how easy is it to then diss all perfume for its metonymic relation to things female? You know, it's frivolous, meaningless, shallow, etc.) Remember when a woman should be seen but not heard? Maybe now she should not be smelled either. I remember one time in grad school, I attended a lecture by a big-name literary figure who shall remain nameless. It was hard for me to pay attention to him, because I was too distracted watching another big-name literary/philosophy figure, Avital Ronell, in the audience. She pulled out a mirror and carefully applied dark, dark red lipstick as the rest of us breathlessly hung onto every oracular, indecipherable utterance from The Master. To be cheeky? For subversive effect? Who knows, but I remember it after all these years. I imagine walking into any public space wearing Gianni Versace would be a comparable move. As one Gianni Versace lover on Fragrantica put it: "It smells like: perfume. I mean that in the best possible way, as in expensive perfume for ladies. I want more." Gaia from The Non-Blonde has written about Gianni Versace, too. beautiful piece, and it makes me lust for the perfume. My all-time favourite. Why has it been discontinued? Thank you for sharing the article. I'd love to try it. Hope to hear more from you.